DOG BEACH, CA. EDITOR: MSNBC reported that a sewer spill has closed Dog Beach in OB. The spill, they reported, involved nearly 15,000 gallons and originated from the Adobe Falls area east of here. An Ocean Beach sewage spill prompted a pollution alert in parts of the area, including Dog Beach on Monday. An estimated 14,850 gallons of sewage spilled at the intersection of Del Cero Ave. and Airoso Ave. in the Adobe Falls area of San Diego. It was caused by debris blockage in a manhole, according to the City of San Diego Waste and Water Department. None of the sewage was recovered, so the nearly 15,000 gallons of sewage flowed into a storm drain that leads to the San Diego River. 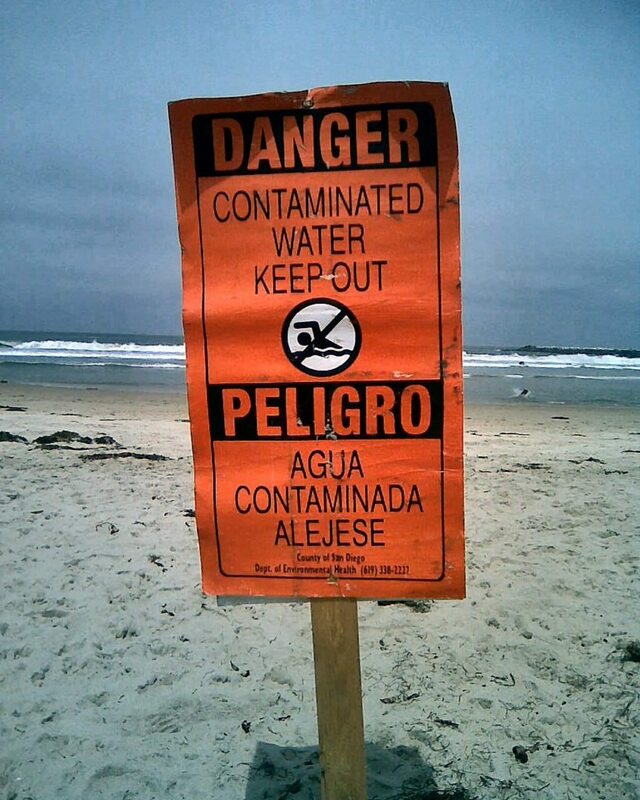 Warning signs about the sewage contamination are posted at the San Diego River outlet at Dog Beach in Ocean Beach and will remain in place until samples confirm the water is safe for recreational use. I guess people are too busy to really care about another sewage spill. I walked down to Dog Beach this morning because I heard there was a major sewage spill and that the beach was closed. Well you can’t really close the beach and folks were still down there surfing and letting their dogs frolic in the waste. I asked one surfer if he was really going to go out in that water and he said, “yeah, he didn’t care” and that he’d just go a few hundred feet to the south. That’s fine, go ahead and get sick dude, but these other numbskulls that let their dogs go out in it are to me nothing short of irresponsible pet owners. Spot can’t read, but Mr. Dog owner can. There’s so little about this story on the web that all I could find was a sentence saying that there was a sewage spill. Yep just another sewage spill, must be why that danger sign is so weather beaten. I’m not sure who’s responsible for the spill though I thought I heard SDSU mentioned. I can’t confirm that so I’ll just figure that someone up river from us just didn’t give a crap, or in this case gave too much crap! At least I couldn’t smell it. I hadn’t heard of the sewer spill either but it is good that it is posted So people do know about it, 15,000 gallons is that a lot? I believe a normal swimming pool holds something less than 10,000 gal- So we are talking about a swimming pool and 1/2 maybe. The total sewage flow in San Diego is somewhere around 175 million gallons/day. So that is way less than 1/100 of a percent of the daily flow. Still too much. And I certainly would keep my mouth shut if I am in the water. The surfer dude who said he was going to surf further south made a good choice. How it happened? Don’t know but often there is a sewerline break. Pipes that are 50 to 75 years old can fail. Sometimes rocks or debris will clog them and sewage will overflow the manhole. Sometimes it is even vandalism, people throw rocks in the manholes just for the thrill of it. City workers are called to fix it usually on OT so they don’t mind and they are used to sewage especially if they read the UT. But they do get it fixed ASAP and the crap is back in the pipe and on its way to Pt Loma Treatment Plant. I don’t know if the sewage will hurt the dogs- I am sure it isn’t good for them but I have seen more than one dog settle down to a nice pile of cat poo and cow pie. I appreciate the voice of reason fstued for I know that you can’t keep a surfer out of the water when there’s a good break. But even keeping one’s mouth closed isn’t going keep bacteria from entering through your eyes, nose or any other orifice. Any open sore can also be easily infected on either man or beast. This has been a pet peeve of mine since I started going to this Dog Beach years ago. #1. The fact that raw sewage is able to run unfiltered through the San Diego River and directly into our ocean and onto our beaches. #2. People not only letting, but encouraging their dogs become submersed in said raw sewage. I wouldn’t let my dog roll in any kind of poop, especially human waste. It just isn’t right, no matter how much Rover may like his new carcass smell. San Diego is not exactly the epicenter of common sense. The San Diego River drains a huge area from its source near Julian. Anything that gets spilled or dumped upstream will eventually make it to Dog Beach. The river drains Mission Valley, Del Cerro, San Carlos, Mission Gorge, El Cajon, Santee, Lakeside and parts of Ramona before it gets to the ocean. That makes northern OB vulnerable to a lot of pollution, especially with our crumbling infrastructure. Even though it goes against our spirit as Obecians, please heed the signs. If only for the sake of the dogs, they have to rely on you. this is so retarded,like seriously just keep the beaches clean, people kinda have to swim in that water!!!!!!!! grrrrrrrrrrrrrrrrrrrrrrrrrr yu but heads keep the water clean!!!!!! The people upstream don’t (pardon the pun) give a crap as long as it is taken away from them. Older Article: A Hot (Chili) Time in OB – The Winners! Newer Article: Busby Bust Based on Bias?